Learn about housing options and solve caregiver concerns. Deal with denial, plan for change, get help. Use Universal Design to aid daily activities. Spot the early warning signs of trouble. Lower the odds of trips and falls by fixing flooring, layout and lighting. Assess and modify stairs and stair rails; learn to put up grab bars and improve bathroom safety. Reduce the risk of fire, with advice on cooking, electrical and smoking-related fires, as well as “exit planning” and preventing heat-related injury. 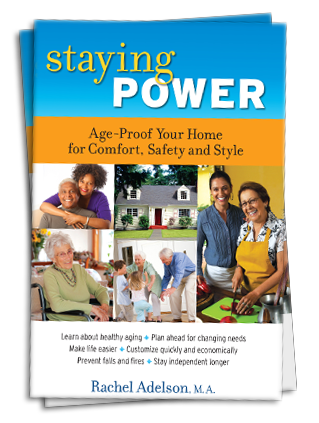 Learn how to go up and down, in and out, and get stuff done more easily by accommodating the pain and limitation of arthritis and other age-related conditions. Make nearly everything easier…save energy for the good stuff. Respond to changes in hearing, vision, touch, taste and smell – in order of appearance in the aging process! With condition-specific advice on vision changes. Get the scoop on normal cognitive aging and boost memory and organization through simple changes. Keep working, pursuing hobbies and an active social life; fight fraud and manage medications. Above all boost fitness through home-based exercise geared for people 50-plus. Be your own trainer! Fix things up around the property and in utility areas. Create age-friendly entry points and walkways. Learn about some age-targeted gadgets and gizmos. Boost that staying power with careful planning and implementation. Balance form and function, make useful lists, work with contractors, contain costs, check on regulations and taxes. You’re home free!